James Hugh Calum Laurie, CBE (born 11 June 1959), known professionally as Hugh Laurie, is an English actor, writer, director, musician, and comedian. He first became known as one-half of the Fry and Laurie double act with his friend and comedy partner Stephen Fry, whom he joined in the cast of A Bit of Fry & Laurie, Blackadder, and Jeeves and Wooster from 1985 to 1999. Hugh Laurie's book The Gun Seller was available from LibraryThing Early Reviewers. Hugh Laurie is currently considered a "single author." If one or more works are by a distinct, homonymous authors, go ahead and split the author. 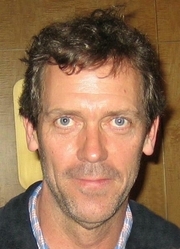 Hugh Laurie is composed of 4 names. You can examine and separate out names.